The Enviro Evolution pellet stove has a large hopper capacity, enabling an extremely long burn time between refills. It has a heavy duty heat exchanger. Designed for quiet running, its self levelling legs are rubber mounted for sound damping. It has a cushion mounted auger, will run without the convection fan, and the combustion fan can be installed outside the home. The viewing window is of a good size, and the fire box is backed with a steel brick effect firebox liner. A bolt on hearth pad is an optional extra. Top and bottom nickel louvres are standard, with the option to have stainless steel sides and hopper lid. Window Size 13in. by 10 in. Construction Type Fabricated steel, cast iron top. Five year limited warranty on all steel manufactured parts. A one-year warranty is provided on all electrical components. The above limited warranties are extended only to the original purchaser. Sherwood industries estimates conservatively the square footage their stoves are capable of heating compared with other stoves of similar output. Inspect burn pot, clean the burn pot liner, clean out air holes, operate the heat exchanger cleaning rod. 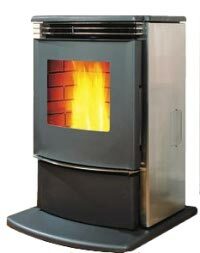 If you would like to leave a review of the Enviro Evolution pellet stove, please use the form on the contact page.